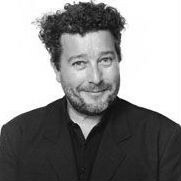 STARCK recalls spending his childhood underneath his father's drawing boards; hours spent sawing, cutting, gluing, sanding, dismantling bikes, motor cycles and other objects. Endless hours, a whole lifetime spent taking apart and putting back together whatever comes to hand, remaking the world around him. Several years and several prototypes later, the Italians have made him responsible for our furniture, President Mitterand asked him to change life at the Elysées Palace, the Café Costes has become Le Café, he has turned the Royalton and Paramount in New York into the new classics of the hotel world and scattered Japan with architectural tours de force that have made him the leading exponent of expressionist architecture. His respect for the environment and for humankind has also been recognized in France, where he was commissioned to design the Ecole Nationale Supérieure des Arts Décoratifs in Paris, the control tower at Bordeaux airport, and a waste recycling plant in Paris metropolitan area.